I went wide open throttle in first gear while moving slowly, and i would assume at around peak torque my drive shaft came apart where the yoke/bearings are. Its still bolted to the hub and still inside the gearbox, it just came apart - the boot flew off, the three or four bearings that are attached to the shaft went who knows where and I had to limp the car home. Car in question - 2009 Subaru Forester XT, 5 speed manual, Making 200kw at the wheels, minor mods. Could not see any stress marks/physical shearing of anything, I don't think its the "shock" from the torque being transffered, as I think the failure would be different - with maybe something snapping/breaking but this just looks like it was pulled out. Last edited by Booki; 08-12-2018 at 04:38 AM. One of two things - you have the wrong axles, or the drivetrain is moving too much allowing the tripod joint to jump out. 1. The nuts on the engine mounts in the cradle are not attached. 2. The rear cradle mount is loose, broken, unbolted at any of 4 different locations. Just so we are using the correct nomenclature: a TRIPOD joint on the inner end of an AXLE only has 3 bearings. Last edited by Elbert Bass; 08-12-2018 at 11:24 AM. I can't see any pictures, might be me. I wondered if there were 2 or more axles for the vehicle. Length being the main thing. I think Elbert Bass gave good things to check. Oh, and those are normally half shafts or CV axles. 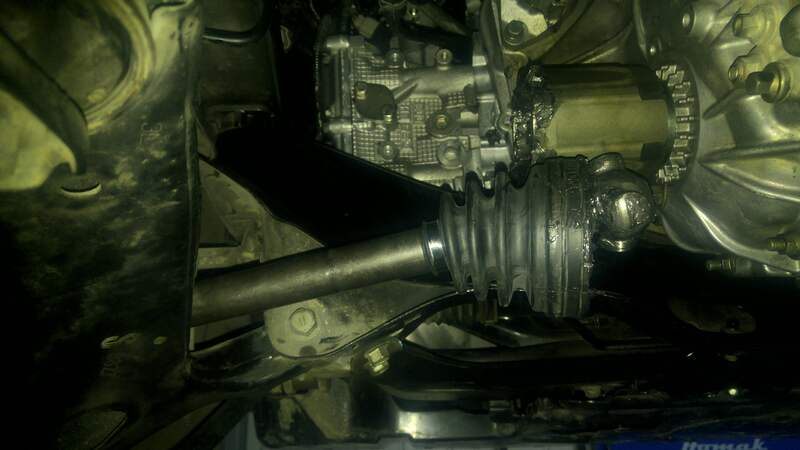 The driveshaft runs from the rear of the trans to the rear diff. I might have got my terminology a bit mixed up - talking about CV's/Shafts that go into the gearbox and drive the front wheels. Thanks Elbert - So far my thinking aligns with yours, the driveshafts are correct. I never had any issues prior so I think a mount or something has gone amiss....seems a bit hard to find though as it only seems to be failing during hard acceleration. I had a look under the car lastnight, the engine mount nuts are still there, All the mounts looked fine for the gearbox, but I did not slap on a wrench and see if everything was tight. There is some movement with the box, I will have to take a classic Booki video and see if the amount of movement I have is normal. 1. Failed motor mounts that allowed the engine to torque twist almost out of the cradle. 2. When I jack up an engine in the chassis and roll it to one side or the other too far trying to beat warranty flat rate doing something you should pull the engine to do. Hmmm, I didn't see any obvious signs of damage, and I have not jacked up the motor to do anything like that. The engine has been out recently and had almost everything replaced. They seemed ok quality when I put them. I think you are right though - I never noticed it before but under acceleration it does look like the gearbox is moving (judging from the way the shifter moves), eg while in 2nd or 3rd and putting on some heavy throttle, not enough to make the CV pull out but enough for it to feel a little "weird". I believe we understood the problem parts, regardless of the terms used. Cursed car? I don't know. I just wish it would settle down so you can go have fun, you have done enough recently. Engine mount is not even a year old! A test is, engine running, E-brake on, hood up, put in 1st and add gas while letting clutch out. Look for motor rock. Do the same in reverse. Should be little to no rock, either gear "should" give the same result. Broken or loose mount will allow more engine rock in one direction and could be doing what you are seeing. If both mounts have issues, there will be a lot of rock in either gear. Thanks Charlie, a workshop I spoke to said the same thing. Picking up a another one today. Another thread coming to a close - It was the engine mount! Very difficult to tell if it was a "superficial" crack until I decided to loosen the engine mount nuts and start raising the engine. Found my original OEM mounts in my "rubbish" pile - put them back in and bam. No more splitting shafts. Lesson's to be learned here - any component you can't really risk failing - buy genuine! Thanks for the update and close out. All the best Charlie, hopefully won't see any more werid threads from me for a while! Thinks to self, "How has it failed?" (I genuinely couldn't work it out from the picture). Question for ya, mate. Sorry to resurrect and older thread. Before you were experiencing then broken axle problem, did you ever have any issues with clutch slip-like symptoms (assuming this was before total failure of the engine mounts)? Hey viper, long time no see bud. No clutch slip what so ever prior to failure. Clutch is quite new so no slipping as yet. That said still to this day I do not go wide open throttle in first gear, my front left wheel still feels a bit of a slop in it. Haha, you haven't posted in a while, which is probably a good thing. I was hoping you had experienced some thing akin to clutch slip. Subaru has a TSB about axles popping out causing symptoms that look like clutch slip but the clutch is fine. I've got an Exedy Stage 2 Cerametallic clutch with 23,000 km's on it and I'm having clutch slip symptoms. Axles I think are seated but I was wondering if maybe one of my motor mounts was about to give up its life and this is a sign before I also start breaking axles. I haven't been able to pull the trans yet to get a good look, but I'm having a hard time with the idea that my clutch is goosed. And after 123,000 km's on the motor mounts, I'm sure they need to be replaced regardless. the old wrx and groupN mounts use metal plates with hooks so this cant happen even with a broken mount. it only allows about 1/2" before catching on the sheet metal bent hook of the mount. i don"t like the new "fluid filled" disk mounts. look at the second pic in this page to see how they work. the only way to get slip is after the axle has broken or if the axle pops out of the splines in one of the diffs. but i think if one of the axles pops out the car would have a pretty hard time going up any sort of incline. it would be like having the worlds most worn out clutch. if it only slips under heavy power i would wager its the clutch, not the axles or driveshaft. Yeah, I'm pulling at straws, mostly and just asking questions to see what else it could be, but everything I check keeps coming back to an issue in the bell housing. I have a thread going and as much as I'd like to pull the trans or engine, I'm tight on cash at the moment and don't feel like doing so until I have some parts like a snout repair kit. I won't go into much more details as it's all on my other thread.